Photo forward adventures in travel, food, & crafts. I love to support local. When we travel we often seek out farmers markets and local products. Supporting a community and the people who live and work there is important. I’m not typically a hot sauce person but it’s hard not to love Crazy Gringa Hot Sauce. I recently got the opportunity to work with them on some photos and during that time I’ve been making their recipes. Crazy Gringa Hot Sauce is a family owned and operated company ran out of Omaha,Nebraska. You can find their sauce in stores all throughout the area including Whole Foods Market. When out this summer at the farmer markets make sure to stop by their tent and meet the Crazy Gringa Mary in person. She’s sure to entertain you and you’re sure to love her hot sauce! Get some high quality bacon! I love the made in-house bacon at Whole Foods Market. I used the savory flavor. 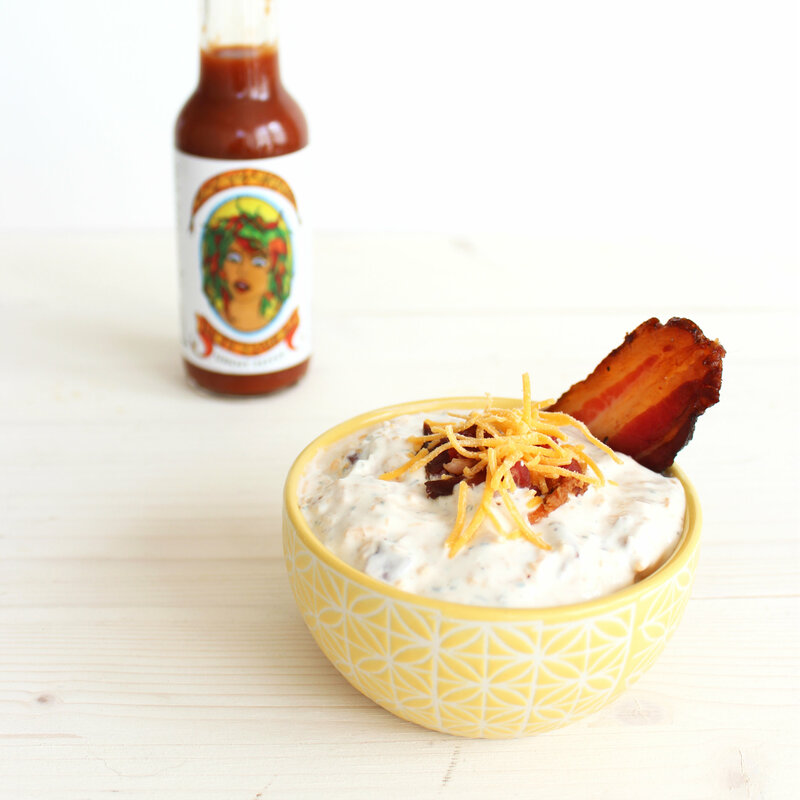 When I made this I used one less tablespoon of hot sauce then it called for…because I’m a sissy. Plan to either, A: eat all of this in one sitting, or B: share with friends and see it get devoured! In a medium-sized bowl, combine dip mix, sour cream, and Ghost Pepper sauce. Stir in cheese and bacon. Cover and chill for at least 1 hour before serving. Sever with potato chips, corn chips, or crackers. Enjoy your dip and check out the other great recipes on their site! FOOD: Flowers & Cheese, the perfect pairing.